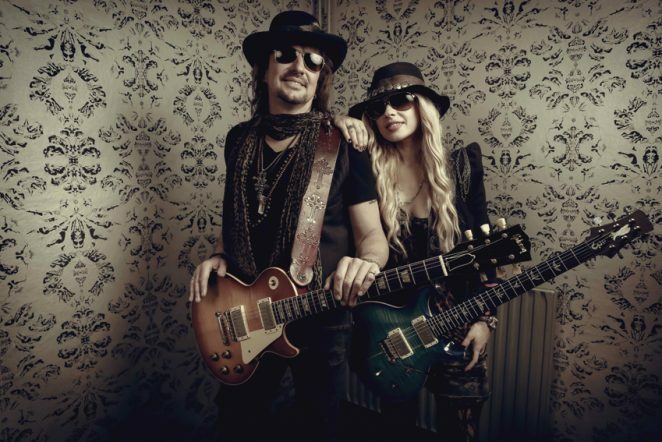 RSO is RICHIE SAMBORA and ORIANTHI, two extraordinary musicians and songwriters who’ve combined their passion for guitars and their magnetic stage presence to form one hot, rock duo. These two Multi-Platinum selling artists have toured the world, written #1 singles, collaborated with mega-stars and released breakthrough solo projects – now they are joining forces as classic rock powerhouse RSO: RICHIE SAMBORA + ORIANTHI. As part of this tour, fans can expect to hear songs from both Richie and Orianthi’s catalogues, Bon Jovi classics, plus songs from other artists they have performed with including, Michael Jackson’s Black or White and Alice Cooper’s School’s Out. The tour will feature world-class guitar mastery, with the charismatic duo creating an extraordinary show. Richie Sambora was a founding member and lead guitarist for Bon Jovi for almost 30 years, co-writing some of the band’s most successful songs such as Livin’ On A Prayer, Wanted Dead or Alive, Lay Your Hands On Me, Keep The Faith, I’ll Be There For You and These Days. He has collaborated with artists like Cher, Les Paul, Desmond Child, Pink and even our own Shannon Noll! Having sold over 100 million records with Bon Jovi, Sambora has released three solo albums, his most recent, The Aftermath of the Lowdown in 2012 after which he toured Australia with Orianthi as special guest, as part of the 2014 Soundwave Festival. Australia’s own rock goddess, Adelaide born Orianthi, is a renowned guitar talent and exceptional, sensitive songwriter. She is one of only three female guitarists ever to grace the cover of US Guitar magazine, the first female guitarist to play in Alice Cooper’s band and was enlisted by the late Michael Jackson for his ‘This Is It’ concert tour (and featured heavily in the film of the same name). Orianthi is one of the most sought after musicians and vocalists in the world. She has been recruited by a host of music legends to add her fiery and melodic lead to their albums and live shows, playing at Eric Clapton’s Crossroad Festival, and with greats such as Alice Cooper, Michael Jackson, Santana, Steve Vai, Dave Stewart, Steven Tyler, Adam Lambert and Michael Bolton. After first appearing as lead guitarist for Carrie Underwood on the 2009 Grammy Awards, Orianthi scored her breakthrough top ten worldwide hit with According To You later that year. Orianthi’s songs have featured in Guitar Hero games and most recently she recorded an all-star version of Led Zeppelin’s Whole Lotta Love featuring AC/DC’s Brian Johnson, Joe Walsh, Johnny Depp and Zac Starkey, on the Hollywood Vampires debut album. Richie Sambora inducted Orianthi into the South Australian Music Hall of Fame in 2015. RSO: RICHIE SAMBORA + ORIANTHI have completed work on a soon to be released but yet to be titled album. My Ticketek members will receive exclusive pre-sale access from 1pm Monday 29th August 2016. Tickets will be available to the general public at www.ticketek.com.au from 9am Tuesday 30th August 2016.